As a regular reader of our food site, you know how we have been loving the products over at Earthy Delights. The package David sent us is the gift that keeps on giving. We are still enjoying the fresh ramp as a tasty pesto. It makes a wonderful quick and easy dinner. 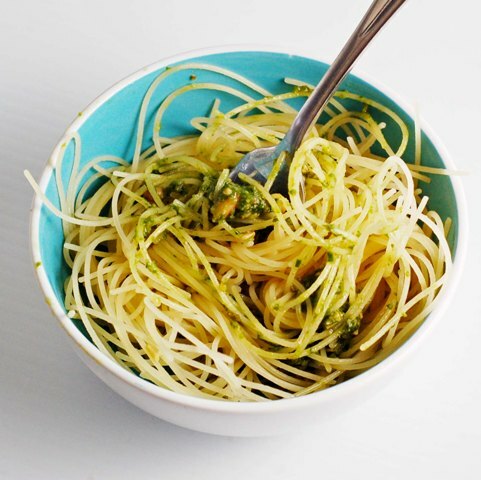 Boil some pasta, drain and then mix in a tablespoon of the frozen pesto. Earthy Delights is America’s Premier supplier of specialty foods to top chefs. They use overnight delivery to make sure the freshest produce arrives from the farm to their kitchens in the shortest amount of time possible. The wonderful team over at Earthy Delights is now offering the same high quality products to you, the home chef. We want you to be able to experience all the wonderful things we have the past couple of months, minus the Ramps, sorry they are out of season now. Earthy has tons of fantastic items from the famed Aged Black Garlic to exotic vanilla products – there truly is something for everyone! We have teamed together with David over at Earthy Delights and are excited to offer you the “Chez Us discount”. Readers of Chez Us, have until August 1, 2009, to use unlimited 15% discounts on anything in the store. This discount will apply to everything except taxes and shipping costs. So, what are you waiting for? There are wonderful things from Fresh European Truffles to fresh Michigan Cherries, to wet your appetite and tantalize your taste-buds. In order to use your coupon, you will need to add all your goodies to your basket and right before you finish your check out you will be asked for a coupon code, just enter: CHEZUS15% and the 15% will be deducted from your total, before taxes and shipping. Have fun shopping! 2 Responses to "Earthy Delights"